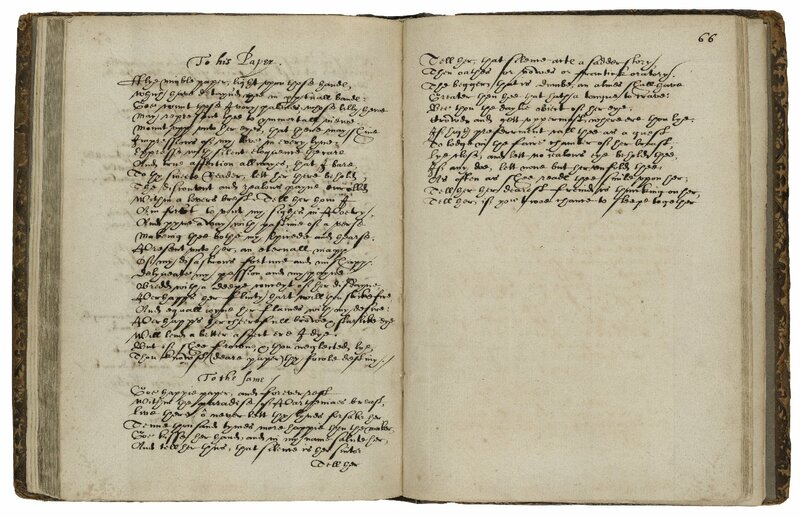 ¶ 2 Leave a comment on paragraph 2 0 Image from Folger V.a.245, a poetical miscellany, ca. 1640. ¶ 3 Leave a comment on paragraph 3 0 Manuscripts flourished alongside books in early modern times, and this multitude of hand-written material has the potential to tell us so much significant information—everyday information often left out of books—if only we could understand the text of these assorted papers. Transcribing English manuscripts from the sixteenth and seventeenth centuries is rewarding and enlightening (and even fun), though not particularly easy. Getting started with the material is usually the hardest part. Puzzling out letters and words is challenging, as most are written in a style known as “secretary hand” (imagine multiple versions of each cursive letter in the alphabet with archaic letters, freeform spelling, and unfamiliar abbreviations thrown in). Furthermore, opportunities to practice reading secretary hand or the mixed italic variants of this style are limited since rare manuscripts are, well, rare. Generally, they are kept locked away in archives for protection and are largely inaccessible to the public. 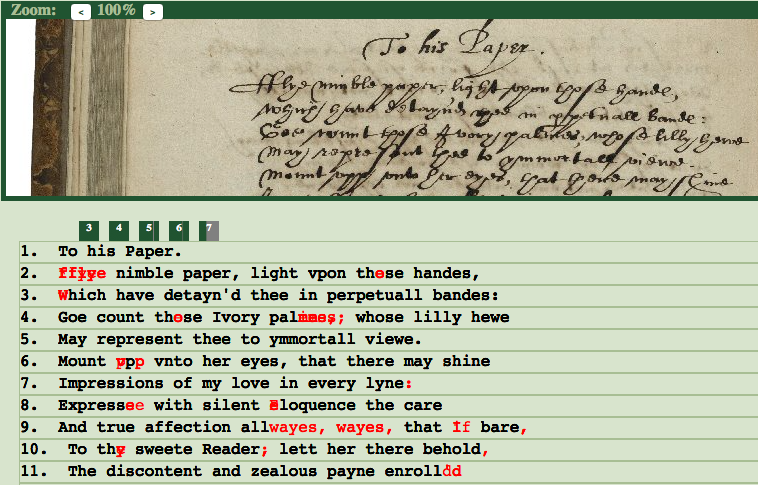 A few web tutorials in paleography (i.e., the study of old handwriting) are available, but they have only a small number of example texts from which to draw. ¶ 4 Leave a comment on paragraph 4 0 Getting past these access barriers to Renaissance-era manuscripts is now easier with help from Early Modern Manuscripts Online, or EMMO. This experimental project started in 2014 with funding from the Institute of Museum and Library Services (IMLS). Based at the Folger Shakespeare Library, EMMO is opening up the archive, as it were, and encouraging interested people to join a massive transcription effort. The goal is nothing less than to transcribe the library’s entire collection of manuscripts dated from 1500-1700. ¶ 5 Leave a comment on paragraph 5 0 Among the manuscripts are letters, receipt books (recipe books), coats of arms, miscellanies, account books, newsletters, family papers, diaries, sermons, and literary works of many kinds. Only a portion of all the Folger manuscripts have been photographed to date, but that number continues to climb (as does the Folger’s overall collection via acquisitions each year). 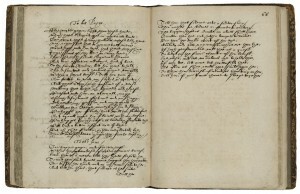 Images of the manuscript pages appear in the Folger’s online digital image collection, also known as Luna. Currently, there are over 43,000 images. ¶ 6 Leave a comment on paragraph 6 0 EMMO takes images and pairs them with a user-friendly interface called Dromio that allows efficient transcription and encoding of the text. ¶ 7 Leave a comment on paragraph 7 0 Image of Dromio interface for V.a.245. ¶ 9 Leave a comment on paragraph 9 0 As the image above from a poetical miscellany shows, Dromio presents a user with an intuitive interface similar to a familiar word processor in which he or she can enter a transcription. This interface floats over the image and can be dragged around as needed. After typing the words as seen in the image, encoding can be added quickly by selecting certain letters and/or words and simply clicking on the appropriate tagging button. ¶ 10 Leave a comment on paragraph 10 0 Image of Dromio interface with encoded transcription entered. ¶ 11 Leave a comment on paragraph 11 0 Dromio formats the transcriptions in XML (extensible markup language) for easy transfer to the web, but transcribers for the project need not have experience with the angle-bracketed codes of XML to participate. The interface lets people encode as they transcribe without having to know much at all about encoding. Most are able to get started on Dromio in five to ten minutes. ¶ 12 Leave a comment on paragraph 12 0 Of course, becoming proficient in secretary hand takes longer, so EMMO sponsors many types of events to teach people paleography, from short “crash-course” sessions in the basics of the alphabet, to week-long workshops, to courses that run an entire month for advanced academic study. Getting used to the creative spelling found in these documents presents an additional trial, as do the words that have fallen out of regular usage. Still, people who stick with it tend to improve quickly as they practice. ¶ 13 Leave a comment on paragraph 13 0 If someone already has skills in paleography and/or text encoding, she or he is most welcome, of course; indeed, many with such knowledge are working with the project. However, we also want to reach those who have not had opportunities for study nor experience in these areas. 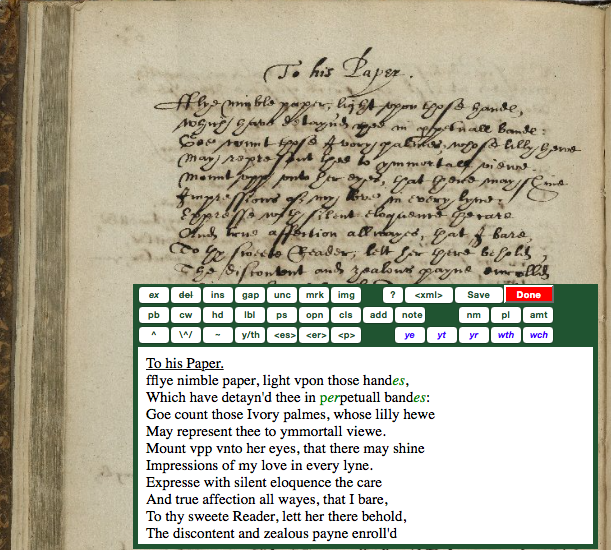 ¶ 14 Leave a comment on paragraph 14 0 Through special “transcribathon” events sponsored by the EMMO team using Dromio and online crowd-sourcing tools such as Shakespeare’s World, which follows Dromio’s approach, several hundreds of new “citizen humanists” have contributed transcriptions to EMMO. Multiple independent transcriptions of each manuscript page image are done, and all of these are compared to one another with the help of computer applications to reach an agreed-upon transcription (or as close to agreement as possible). 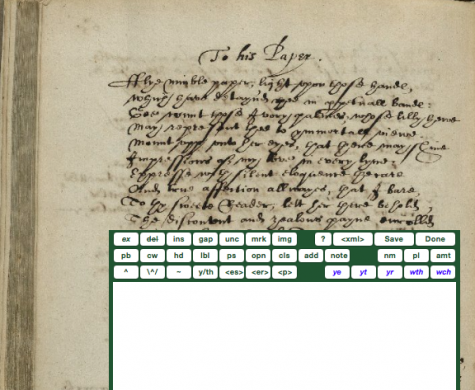 Paleography is more of an art than a science, after all. 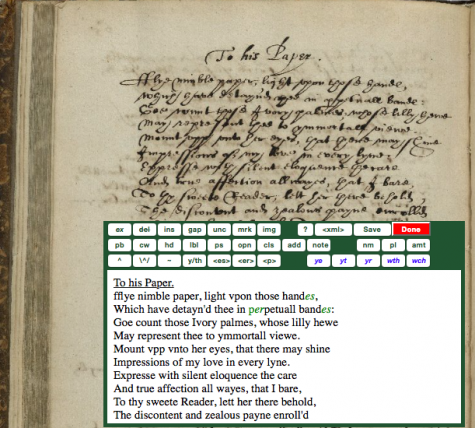 ¶ 15 Leave a comment on paragraph 15 0 Image of the Collation feature in Dromio. 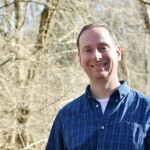 ¶ 16 Leave a comment on paragraph 16 0 Using the computer-generated aggregate of transcriptions and encodings, an expert paleographer on the EMMO team then vets the transcription. Once that step is complete and any final XML encoding is done to ensure compliance with the TEI-P5 guidelines for texts in digital form, the transcription will be made available to all via an online, searchable EMMO database (to be launched in 2017). It will take time to build the corpus of manuscript transcriptions, but putting this information on the web—for free—opens a vast new resource for teachers, students, researchers, and the general public to make all kinds of discoveries about the early modern period.